My newest item listed on Webstore. It is a stretch bracelet. 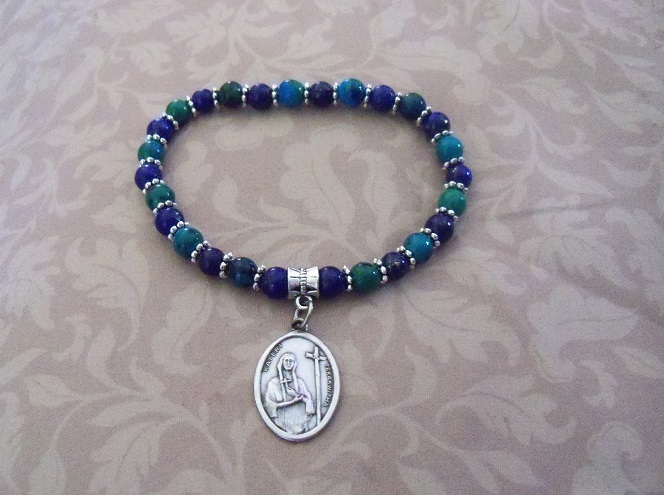 The beads are regular Lapis and Phoenix Lapis along with silver metal bead spacers. And a Saint Kateri Tekakwitha medal in the center. This entry was posted in Crafts, Jewelry, Native American, Online Store, Shopping and tagged Bracelet, Crafts, Jewelry, Native American, Online Store, Saint Kateri Tekakwitha, Shopping, Tsalagi Dreams. Bookmark the permalink. Love your choice of colors! It is beautiful!